Leading New England material handling company will be regional supplier of innovative line of fall protection systems in four states. Safety has always been the top priority for our company and customers. We’ve put our faith in SPANCO products for years and are pleased to represent another quality product line. Bode Equipment Company (Bode), New England’s premier provider of material handling, overhead door and loading dock solutions, is pleased to announce that it has been named the exclusive, regional distributor for SPANCO Rigid Lifelines in four states. Bode will be the sole supplier in New Hampshire, Vermont, Eastern Massachusetts and Maine of this innovative line of fall arrest and fall restraint systems. 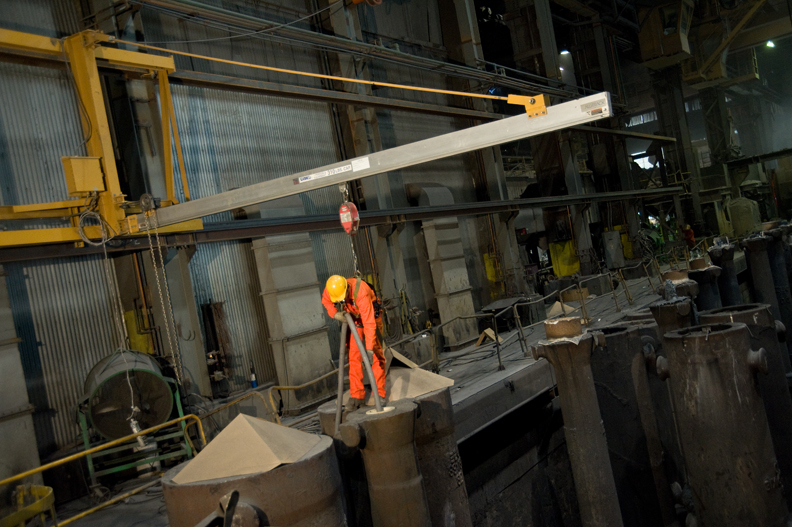 A division of leading crane manufacturer, SPANCO, Rigid Lifelines offers a full line of solutions for common industrial and construction setting fall hazards including portable and permanent fall protection systems. Rigid Lifelines fall protection systems exceed OSHA standards and ANSI guidelines through the use of a unique horizontal steel track system. While wire rope fall protection is widespread and OSHA approved, it fails to fully protect a worker because of rope sag. This additional slack can extend a fall by as much as eight feet, putting workers at risk of injury as they come in contact with outcroppings, ladders, or even the ground. Rigid Lifelines fall protection systems are built using a rigid horizontal track that workers connect to using a self-retracting lanyard on a moving trolley for easy lateral movement. During a fall, Rigid Lifelines provide protection as soon as the self-retracting lanyard locks, eliminating rope sag and the potential for injury. Bode Equipment Company has been servicing New England industrial and commercial customers since 1975. Offering a wide variety of material handling solutions as well as loading dock and overhead door services, Bode Equipment Company has grown to be one of the largest providers in the region. With a local presence in Massachusetts, New Hampshire and Vermont, we offer design, layout, sales, installation and service. For more information, please visit http://www.bodeequipment.com. SPANCO, Inc. is an industry leading crane manufacturer that produces freestanding, cantilevered rigid track fall protection systems under the brand name Rigid Lifelines. Since 1979, SPANCO has taken great pride in providing cost effective lifting, moving, and fall protection systems while continuously reaching new levels of innovative design and safety. Learn more about rigid track fall protection you can trust and start protecting your valued workers by calling (800) 869-2080 or visiting us online at http://www.spanco.com.